Indicator-cpufreq can't manage more than one core. Report errors and bugs to <email address hidden>, please. maximum transition latency: 8.0 us. current policy: frequency should be within 800 MHz and 3.00 GHz. 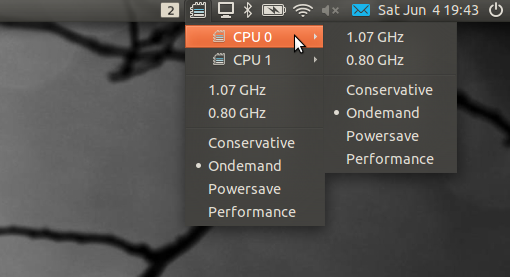 Possible GUI for handling several cores might be a preferences dialog, where affected CPUs will be selected by checkboxes. With the > being a submenu. Then in each of those 4 submenu's you'd have exactly what you have now. Thats just my idea tho. I'm sure there are other better ones. Comment #2 looks reasonable to me. Hope to see this soon in PPA. I also have a similar problem - changing settings through the indicator on a dual core system only changes the freq of the first CPU. If it could or has to be done in a way that changing a single performance setting modifies all 1-6 cores at the same time, I think that would be acceptable. Changing each core individually would be a nice bonus, but how many people really do that? I have to confirm that Emre's script works well on my Maverick 10.10 Thinkpad T60p - the indicator changes the frequency for all cores at the same time. Emre's script works fine, but only in /usr/lib/pymodules/python2.6/indicator_cpufreq. If you have 2+ Cores you must change in line 37: FIXME_CPU = 2 in FIXME_CPU = "NUMBER OF CORES" (without quotes) to enable the other cores. Can Emre integrate somekind of core number variable to fix FIXME_CPU = NUMBER OF CORES to reflect the physical number automatically? Emre's script is working fine! I made a little mockup for the indicator-cpufreq on multi cpu/core system in "Ondemand" mode (cores can run at different frequency). I don't know, if anyone likes the idea. + Only one core managing with indicator-cpufreq. Karesz, I like your modified indicator icon. What did you change? I like the mock-up and also the idea in comment #2. I hope it will be integrated soon. P.S. : I do change core speeds separately. I'm attaching a proof of concept patch that I'm using which provides multicore support. Also the display icon (since there is only one) would use the frequency of the fastest running cpu. (This would give the indication that one of your CPU is on full wack for instance). actually implementing the submenu approach was quite easy, see the attached patch. now the icon reflects the state of the highest frequency among all the cores. the state of the CPU on the current line. I've only tested with two CPUs but it seems to work fine, so please patch against current trunk, test and enjoy. That's why I don't like per-CPU indicator approach. Instead, I'm going to implement switching governors for all cores (and displaying something like the mean frequency for all of them, perhaps). I shall get back to this as soon as I finish my thesis. If anyone comes up with a patch before this, I'll gladly accept that. > That's why I don't like per-CPU indicator approach. What do you not like exactly ? > Instead, I'm going to implement switching governors for all cores (and displaying something like the mean frequency for all of them, perhaps). don't care and they wouldn't use the applet in the first place. but I dont know if there exists SMP conf for which you can have slightly different cpus. - the main icon shows the state of fastest CPU. (or there could be an extra global entry which sets it for all cores). > I shall get back to this as soon as I finish my thesis. If anyone comes up with a patch before this, I'll gladly accept that. Right, showing the highest frequency among cores is reasonable. The fine-grained control however looks like bloat. Why on earth would you waste time navigating submenus and switching governors for every core, Kim? Here is another take, which includes global setting. I'm attaching indicator.py directly instead of a patch since I rewrote most of it. for benchmarking purposes. I admit that this is kind of a corner case though). old panel applet, with only one status icon. ugly and thought I'd let people know about it. FWIW I'm in favor of being able to set the frequency for cores separately. My reason is that my laptop tends to overheat when it's running at full speed. So I have to reduce the heat production a bit, but I still want one of the cores (I only have 2) running at full speed. I know that running BOINC on a notebook is probably not the wisest thing but hey, Linux is about choice. Anyway, I support Kim's idea and hope that you'll accept it. I used the old indicator because I run CPU intensive processes and I wanted to know when they finish. I also think that knowing if some process is running wild is very useful. On the other hand, if you have two cores, and are running a CPU intensive process on one, having displayed only the maximum frequency will not tell you what happens on the other cores. I like very much the idea by Karesz (comment #11); after all the space on the bar is wasted by the (useless) CPU icon more than by the thermometers icons. Well, 3^4 is not a big number, and each icon would cost only a few kB on your disk. Even if you plan to keep all of them in RAM, it would be about, say, 100kB? My system monitor says that currently indicator-cpufreq needs about 11MB of memory, so it would be an increase of less than 1%. And I guess most people do not have 4 cores with 3 CPUs (and, if they do they have quite a powerful system, so maybe they can waste some RAM for the icons). (my desktop machine, a core i7 has 4 cores each of which with 2 hyperthreads, which show up as 8 processors). (or any kind of image buffer) for the icon would be useful, but libdbusmenu/appindicator do not allow that for now. Frequency is toggled for all cores now, renaming to track per-core switching in this bug instead. summary: - Only one core managing with indicator-cpufreq. "> Instead, I'm going to implement switching governors for all cores (and displaying something like the mean frequency for all of them, perhaps). don't care and they wouldn't use the applet in the first place." That's absolute rubbish and a ridiculous assumption. I use it for exactly this reason to prolong the life of the battery, and restore full power as and when I need to. "Frequency is toggled for all cores now, renaming to track per-core switching in this bug instead." Has this been released? Does the current version do this or is it in the next release? The current version throttles frequency for all CPU cores simultaneously.